Google seems to surprise us, especially the webmasters with its yearly changes in its ranking algorithms, and 2017, is not an exception. This year too, Google brought about some changes in its mobile ranking factors. Wait, a minute, you might be thinking what it has to do with its SEO and the ranking of the website. Well, it has lot to do with it. Since, Google started indexing the desktop and mobile sites separately; mobile search engine optimization has never been the same. With the indexing of the mobile sites gaining prominence, there came a revolutionary change in SEO. In order to stay on the top position of the SERP’s it is very important to make the website mobile-friendly. 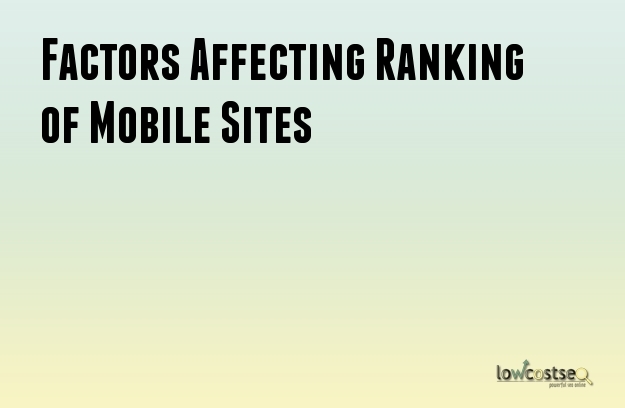 In order to make your mobile website rank higher, you will need to keep in mind certain factor. The factors can be divided into three separate categories i.e. technical, user-experience, and content. Based on a Mobile Ranking factor study conducted by Searchmetrics it has been seen that a good speed of a mobile site should be 1.10 seconds. This speed can gain you top place on the list; whereas speed like 1.17 seconds can makes your site rank low. AMP can have a positive impact on the ranking as well as on the click-through rate. It can help a site to load faster and offer best user-experience. You should not try to use this technology for the mobile pages. It can get a site penalized also. If your mobile site is facing any issues like 404, it needs to be fixed immediately. Ignoring small problems can lead to serious issues and it can lead the ranking of the site. Visual media can make the site lot more enjoyable. You should not try to use too much of images. However, you should optimize the size of the images for reducing its file size and dimension. If you want your mobile sites to get rewarded by Google, then try to use unordered lists. For your mobile site, you should try to use large fonts. It would make the content easily readable and won’t affect the ranking of the mobile site. Mobile sites that obstruct the content with annoying pop-ups can get penalized by Google. It can affect the ranking. So, you should try to avoid it. When you are using small elements like buttons, it shouldn’t be too small for operating with fingers. Also, it should not be placed too close. It can affect the ranking of the site. Mobile sites should try to keep up with short content. However, the content should not be stuffed with too many keywords. Keeping it minimal can help a site to get a good mobile ranking. At the same time providing keywords in the external links can affect you badly. Ignoring these factors can be a very risky move for your site to rank higher across the SERPs. In order to make the mobile site rank high, the following points must be kept in minds.